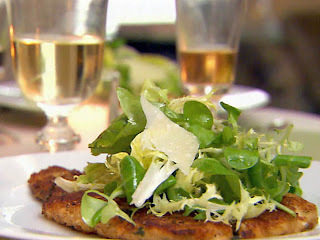 Here's the picture from Food Network of the Chicken- mine actually looked just like the picture! Gotta love the Barefoot Contessa!!!!! 1. Sprinkle chicken evenly with 1 teaspoon salt and 1/2 teaspoon pepper. 2. Whisk together 1/2 cup milk and egg. 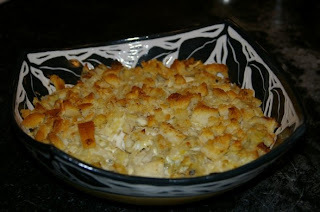 Dip chicken in milk mixture, and dredge in breadcrumbs. 3. Pour oil to a depth of 1/8 inch in a large skillet over medium-high heat. Cook chicken in hot oil about 10 minutes on each side or until done. 4. Transfer chicken to a baking sheet. 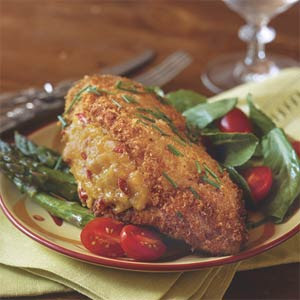 Hold chicken with tongs, and cut a slit in 1 side of each chicken breast to form a pocket. 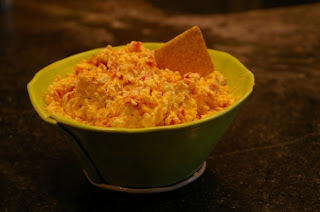 Spoon 1/3 cup Pimiento Cheese into each pocket. 5. Bake at 350° for 2 to 3 minutes or until cheese is melted. Garnish, if desired, and serve immediately. I'm just going to have to face fact- I think being a chunky-bride is in my future. The cheddar and cream cheese are easiest to work with if they are close to room temperature. Grate all the cheese (you can use a cusinart on grate mode, or hand-grate. Just don’t buy pre-grated cheese!!!!). Drain the pimentos and mash up some with a fork. Mix together the cheese and pimentos in a large mixing bowl. Add the cream cheese- you might need to smash it against the side of the bowl with a rubber spatula to get it to the right consistency. Add mayo- this is a personal preference- I use about ½ a cup (dry measuring cup), but start small and add til you get the consistency and texture that you like. Then add pepper and hot sauce to the spiciness you want- I didn’t do that much for this batch (about a heaping teaspoon of cayenne, and 8-10 shakes of Tabasco). Let everything chill a couple of hours, then you are ready to dig in!! Spread on cookie sheet covered with aluminum foil, and roast for 25 minutes (might want to turn a couple of times). Turn oven to 400 when artichokes are done. Meanwhile mince onion and garlic. Heat other T of olive oil in 10 inch skillet until shimmering. Add onion and cook 6-7 minutes. Mix onion garlic mixture, cream cheese, ½ c. parmesan, and mayo in large bowl. Put on topping (see below) and bake at 400 for about 20-25 minutes until bubbly. Yum! toss with melted butter and parmesan. You can also make spinach artichoke dip by adding a 10 oz box (cooked and drained) of frozen chopped spinach to the onions in Step 6. 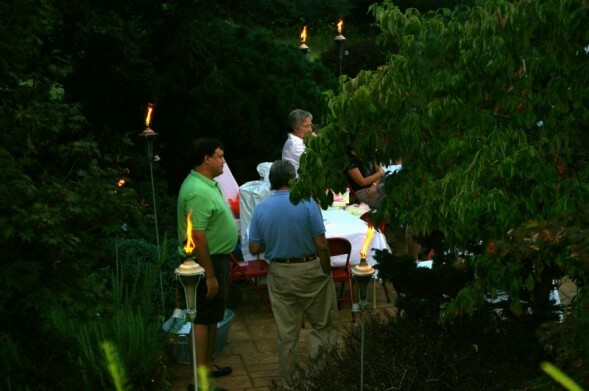 Last Friday we threw a couples baby shower down by the pool- I appropriated by parents house for the event, since there was over 40 people there. Four couples pitched in, which made everything really easy. 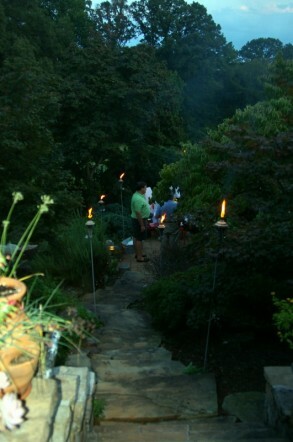 This is the walkway down to the pool- the party was super casual with tiki torches everywhere (unfortunately that did not help with the mosquitos- boo). 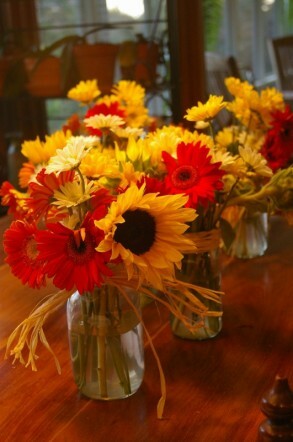 These flowers for the couples baby shower were super easy. 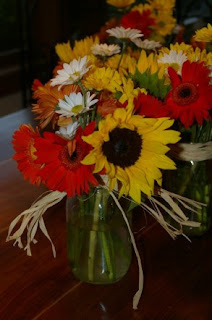 Just sunflowers and daisies from the grocery store- I put them in old jars- Mason and even a pickle jar, then wrapped raffia around the top. 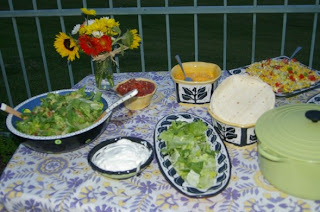 Here is the Tex Mex Spread- we had guac, queso, and salsa to start with (which I totally cheated on and bought from Sam's- this being a lawyer thing really cuts into my cooking/entertaining time). I am so lucky because my mom is an incredible potter- I just rob her studio whenever I need serving dishes! All of the awesome black and white dishes we used are hers. I did marinate 4 huge flank steaks overnight, which Morgan grilled for about half an hour on really low heat. The marinade was awesome- for 2 lbs of meat, 1/4 c. of vegetable oil, 1/4 c. soy sauce, chopped green onions (about 2 T.), couple of minced garlic cloves, 1 heaping t. of celery salt, and few shakes of tabasco. The meat stayed warm in my Le Creuset dutch oven (http://www.lecreuset.com/) and I served it with warmed tortillas, cheese, sour cream, and salsa. 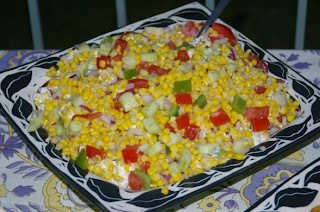 One of the hostesses made an awesome corn salad- it was pretty and so so good! 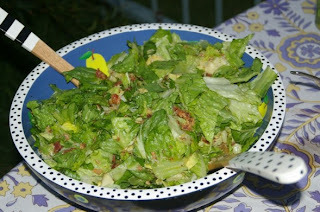 She also made a green salad. 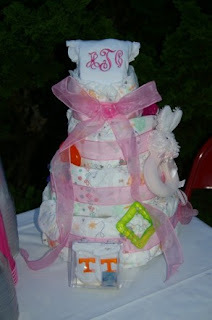 Another Hostess made this really cute "diaper cake" which was the centerpiece for the drinks table. Not the best picture, but you can kind of see the tables- just card tables with white tablecloths. 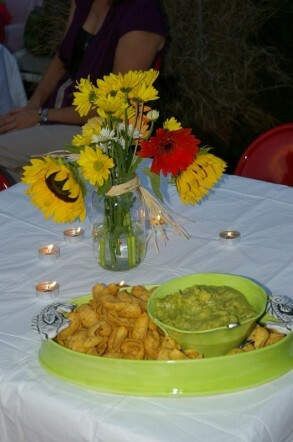 We borrowed a bunch of folding chairs (bright red) but that looked great with the flowers and tex-mex kind of theme.